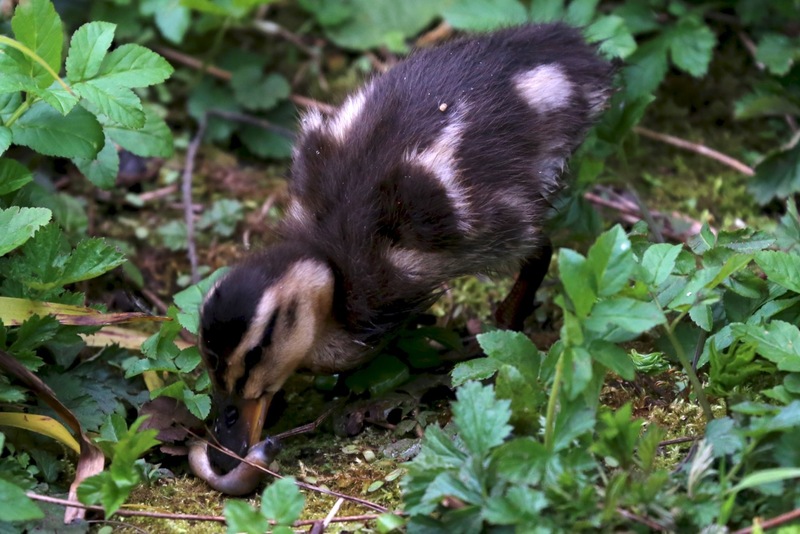 The Mother Duck who laid her eggs, under the elderly sage bush in our neighbours garden, went on to hatch 13 ducklings, one sadly died on the first day, 4 more died during April, most likely because of our exceptionally cold nights, 8 survived. On Bank Holiday Monday we got up to find all 8 ducklings in our garden, with the Mother, a Drake and another slimmer adult female. During the previous week The Mother and slimmer female had been flying in to visit us here. 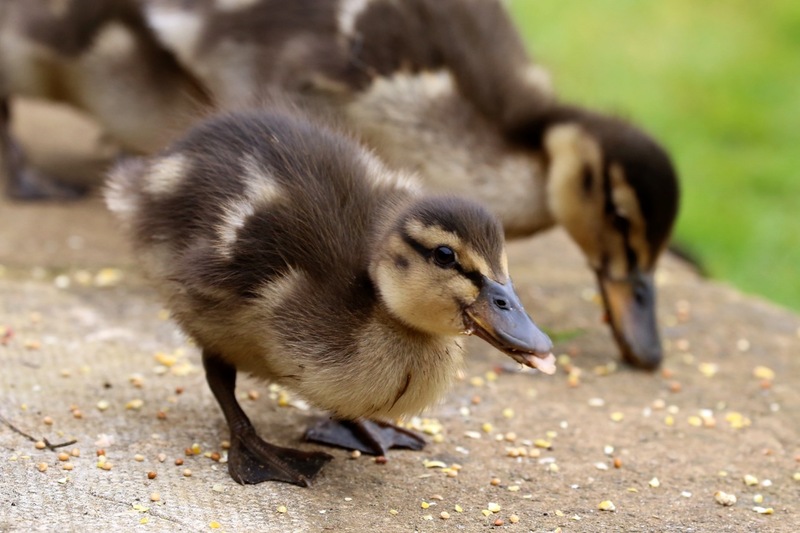 With warmer nights our neighbour, 2 doors away, had corralled the mother and her 5 week old ducklings into the rear of his garage, then opened the front garage door to let them into the lane, hoping they would make the short journey to one of the 3 rivers our lane crosses. 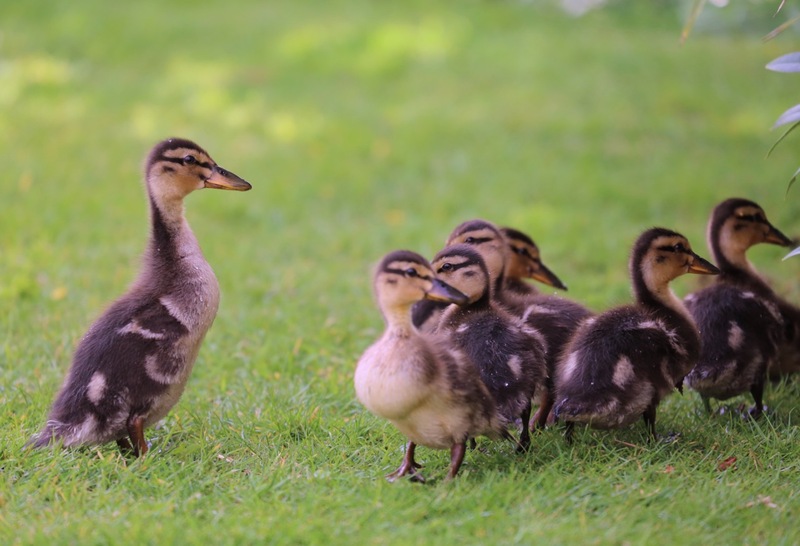 Although they have a small pond, they could no longer live there, the garden is fully enclosed with no independent route out, the Ducklings needed to be much closer to the river, where they could learn to forage for themselves. But 5 weeks is still too young to go it alone. They needed their Mother to lead and protect them. Somehow, the Ducklings made it to ours, rather than the river. We do have holes in the fences for hedgehogs and the hole still remains, where I cut the fence to let last years ducklings out to reach the river. As you can see, at five weeks old their wings are virtually non existent. Flight feathers are not yet formed. 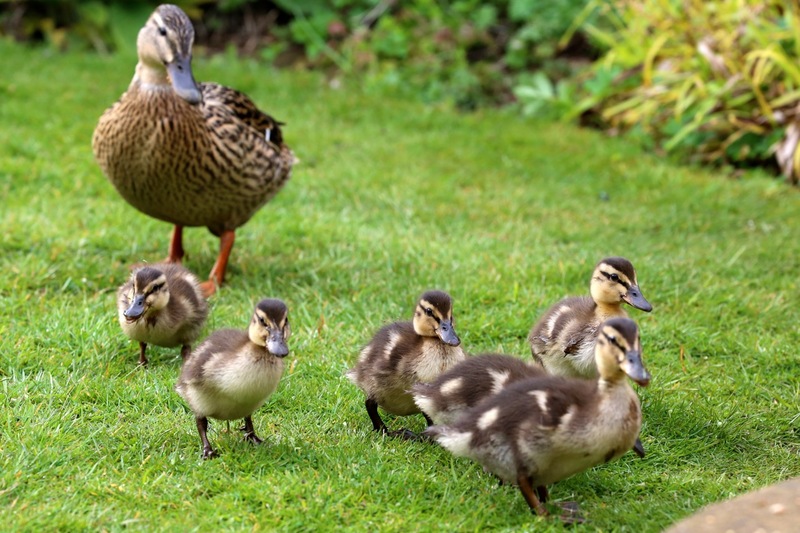 The Mother can fly in, the Ducklings must walk. 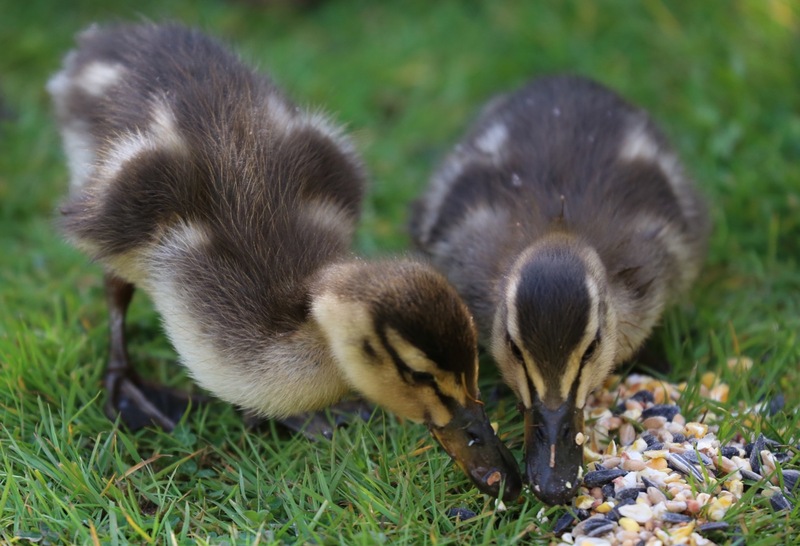 Whilst she watched, we gave the Ducklings some dried mealworms and mixed bird seed. 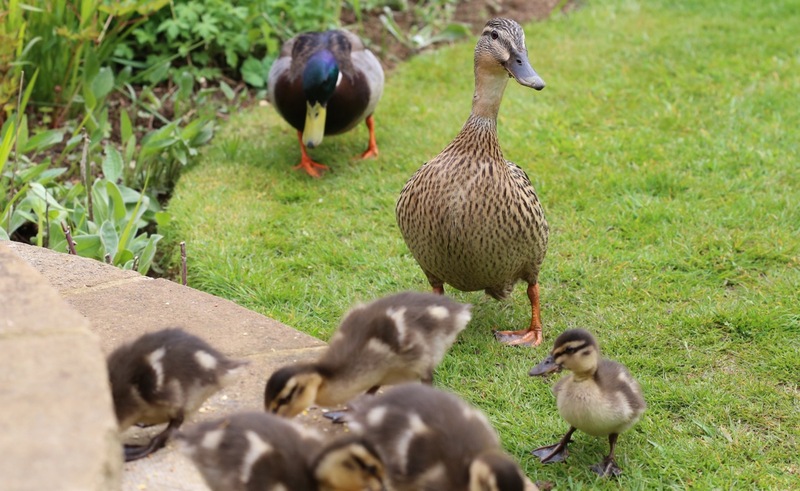 The Drake ran in to shoe the ducklings away from the food, so that he could eat and the Mother shooed the other female off when she tried to get too close to her children. 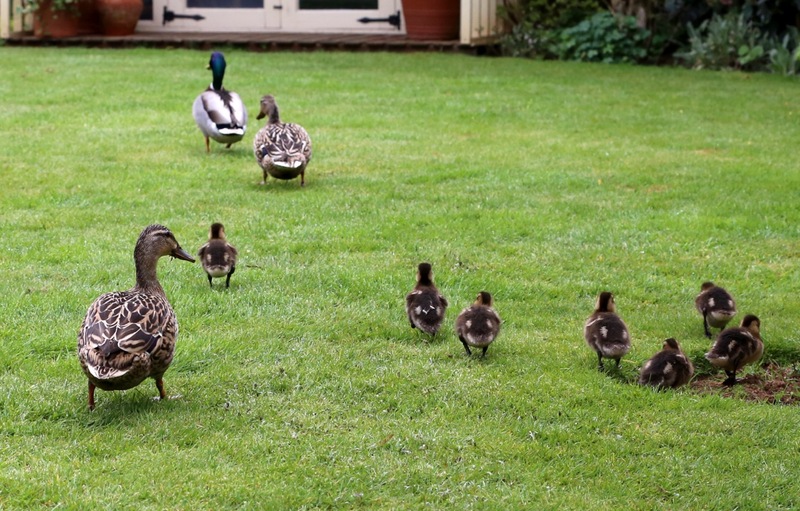 The Drake finally wandered down the garden and the Ducklings and Mother were able to eat, without interference. Then a second Drake arrived. One pinned the head of the second smaller female to the ground, whilst the other forcibly mated with her. The Mother flew off, so did the two Drakes and the smaller female followed. 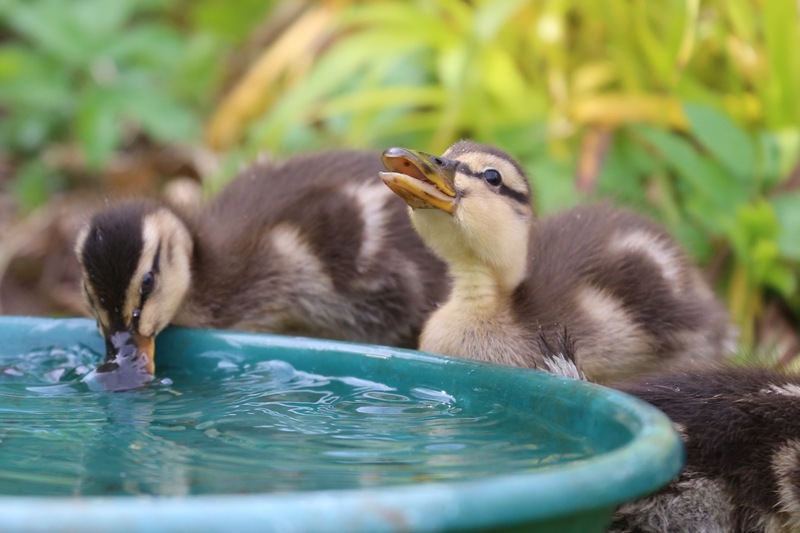 An hour passed and no sign of the Mother, the Ducklings remained sitting in the sun, waiting for her, so we put out bowls of water in the shade for the Ducklings to drink from. We haven’t got a pond, we did once when we moved here, an enormous thing where the previous folk kept huge Goldfish, we filled it in, ponds and young children are not ideal, no end of ‘please do not go near the pond’ worked. Our new wildlife pond is still being dug out, ironically the Bank Holiday Monday project. 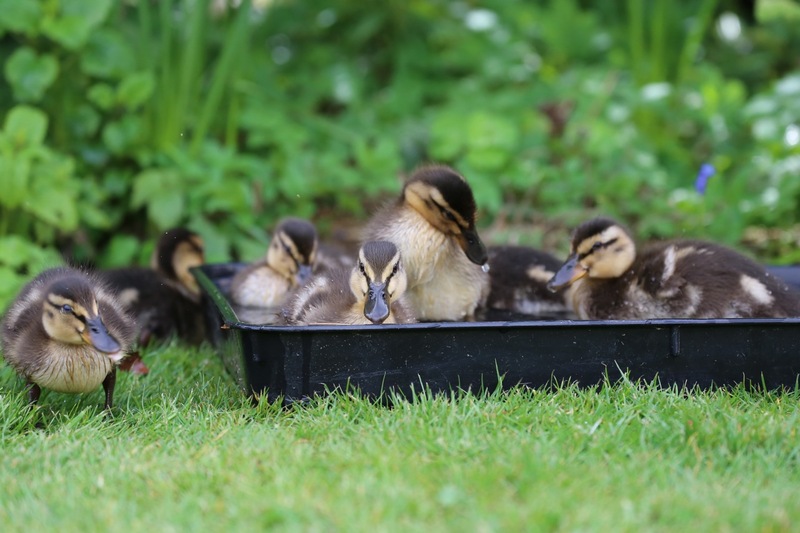 Finally the ducklings settled in the shade, dipping in and out of the makeshift potting tray baths. 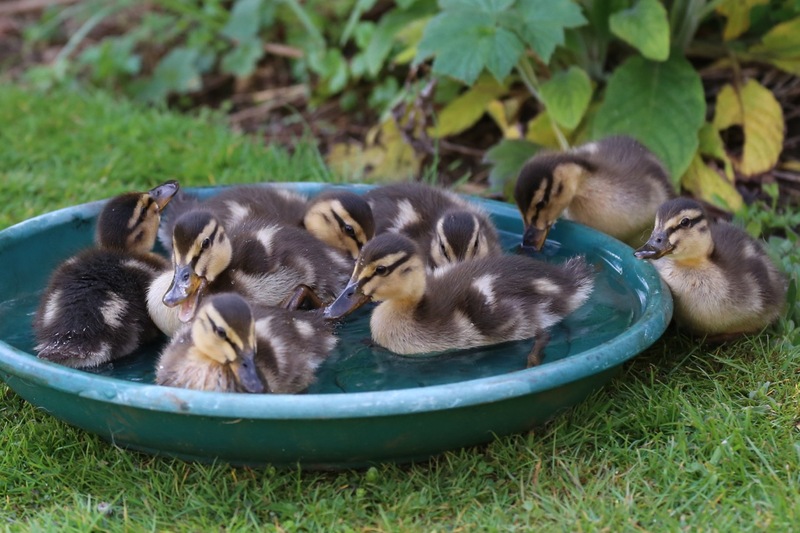 At five weeks old, their down is not waterproof, the RSPB report the mother waterproofs the ducklings. We thought the Mother would come back soon, to care for her Ducklings, 4 more hours passed and still no sign of her. Several water bath changes, more mealworms and to my delight the Ducklings were finding slugs to eat. But still no sign of what they really needed, a Mother to lead them to the river. A fox visits our garden, he leaves footprints in the vegetable beds, so we knew they could not stay here, with or without a Mother to protect them, we have a dog, bringing them indoors was not an option, the potting shed is occupied by nesting Robins and the Summerhouse jam packed with stuff, plus they needed to be somewhere she could find them before a predator did, pondering our options, we went for an long overdue dog walk, hoping the Mother would come back, look after her Ducklings and take them to the River, only a few meters away, they were so close, yet so far. 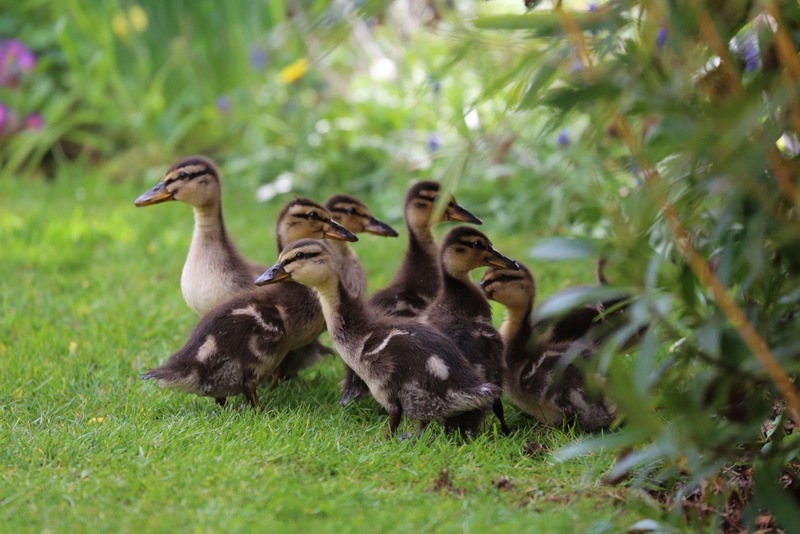 When we came home, there was no sign of adults or Ducklings, with fingers crossed we hoped the Mother had come back for them and led them through the hole in the fence to the river and the next stage in their hazardous lives. 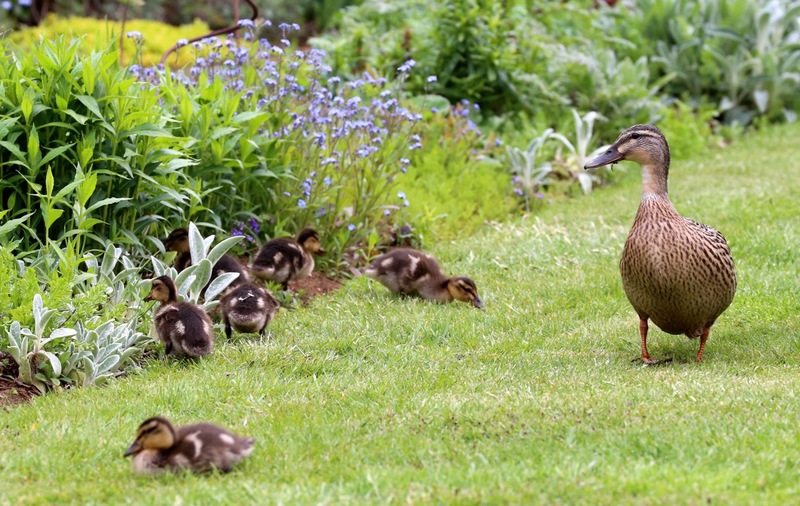 Or that the Ducklings had hunkered down in the shrubbery somewhere and she would find them, when we could not. At 6p.m, (Monday), The Mother flew in with a Drake and the other female and no Ducklings to be seen. Yesterday (Tuesday), morning still no sign of the Ducklings. At lunch time yesterday, when I was yet again wearily re sowing beetroot, chard, peas and mangetout, I found one Duckling, fully intact but dead, about 3 inches deep under the ground in one of our vegetable beds. One of several things may have happened. – We have voles tunnelling through the veg beds like crazed things, the Ducklings may have been looking for worms and one ended up in a tunnel. Or the Fox buried the Duckling – does this happen? Before finding the dead Duckling I briefly thought one positive of a Fox visit maybe he deters the Voles, in the same way, the scent of our Dog deters Moles from tunnelling through the lawn. Then after discovering the sad little body, thought, what a crap way for a 5 week old Duckling to die and what could or should I have done to prevent this. 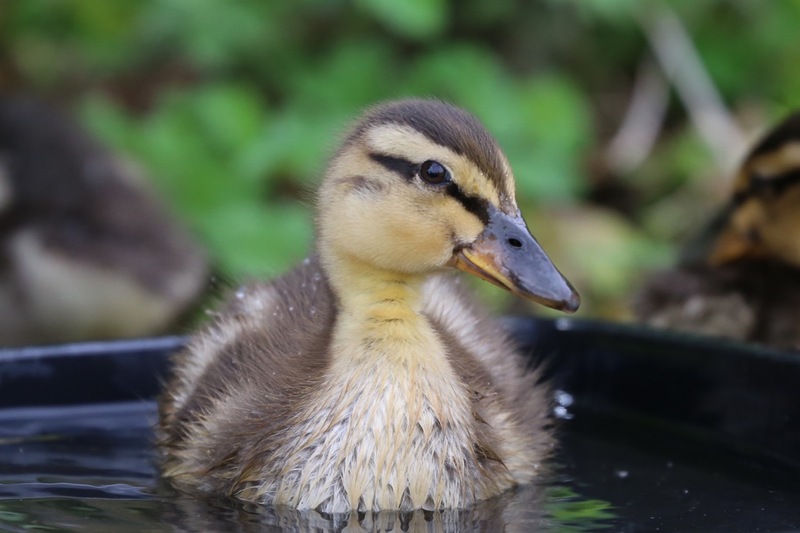 The RSPB report Ducklings are 50 – 60 days old before their wings enable them fledge and be independent, our visiting ducklings were only 35 days old. I hope wherever the remaining 7 are, they are safe, and that she has found them. I have not seen the mother today but the drake and his new female are sitting in the shade in our garden. In more hopeful news, Robins nesting in our Potting shed are still there and we see the parents fly in with food. Nest building continues elsewhere and we have been happy to see lots of bird species collecting Archie’s pegged up hair, the forecast this week is warmer too, so kinder for young chicks and nesting parents. 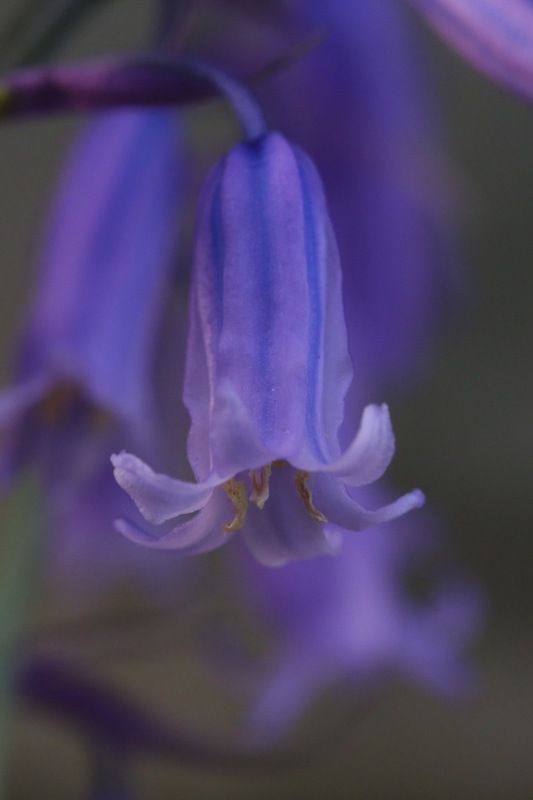 Please take a look at other Wildlife Wednesday posts hosted by the lovely Tina at My Gardener Says. And hopefully happier Wildlife Watching for you! Post script. Thursday May 5th. I have found a second duckling under the soil in one of the veg beds. Sadly Foxes do cache prey. 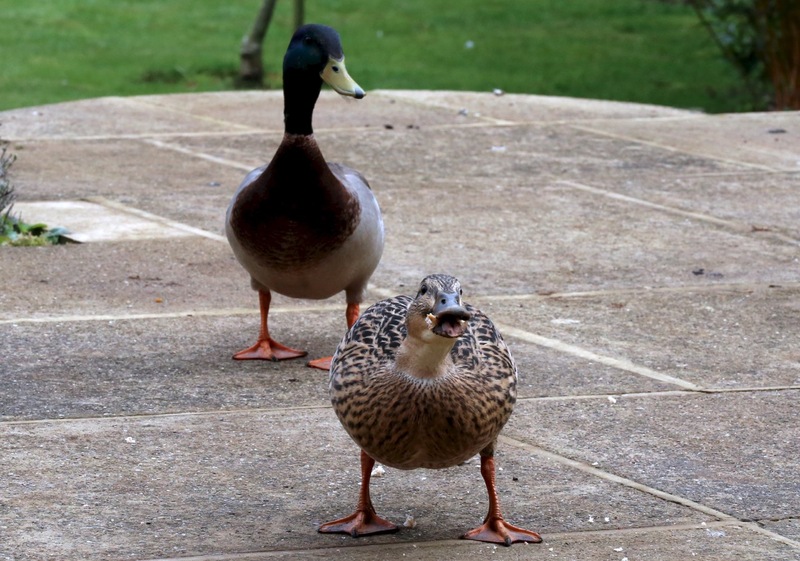 We now believe the ducklings were still in our garden and Tuesday night were predated and cached by the visiting fox. Below are two helpful articles on Fox Behaviour and Wildlife Food caching. 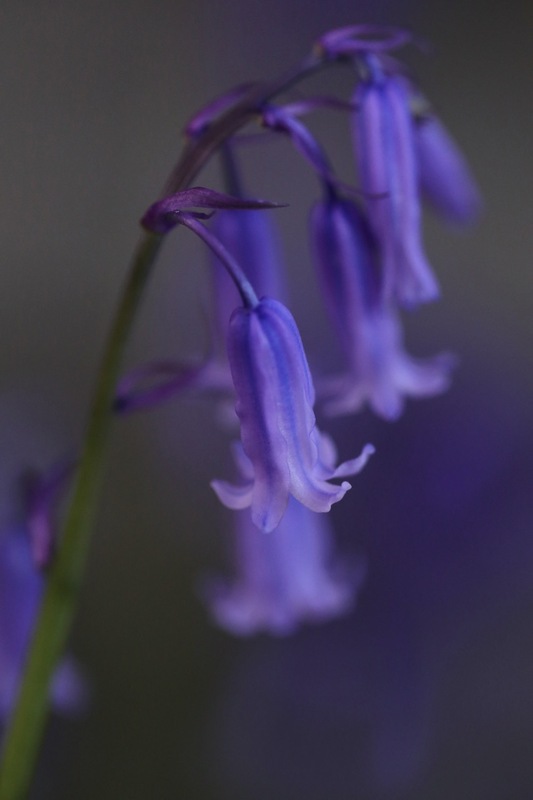 Native Bluebell – Hyacinthoides non-scripta – nectar rich and visited by Bees, Butterflies and Hoverflies. 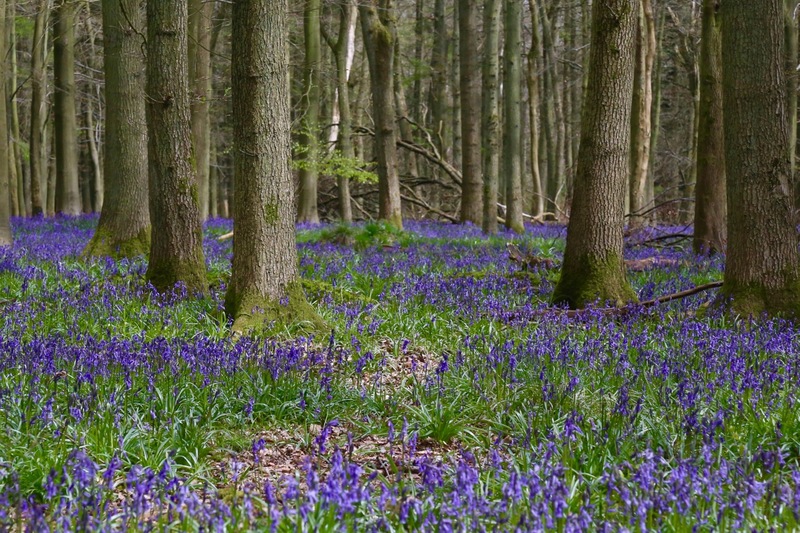 Warren Wood, Bedfordshire. 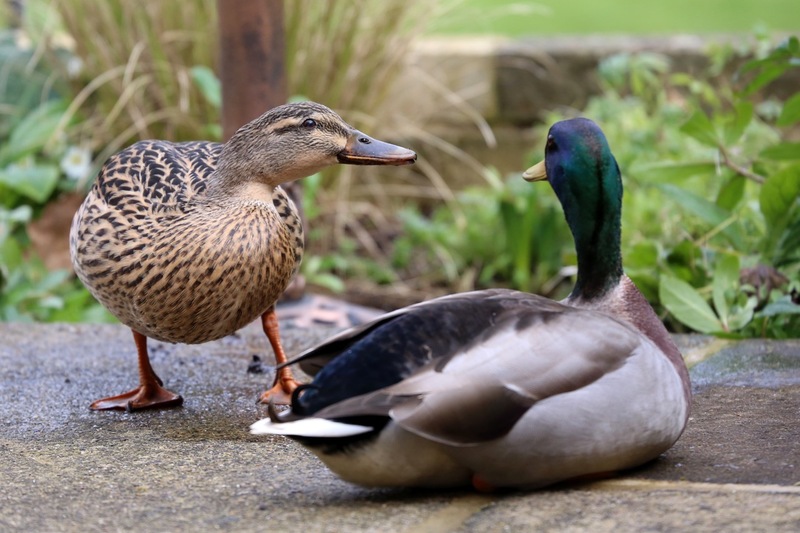 A pair of wild ducks have been visiting from early March, the drake does not eat but protectively keeps guard over the female and watches her, my hopes were up that she was nesting in our garden. He seemed to love her, despite her manners. 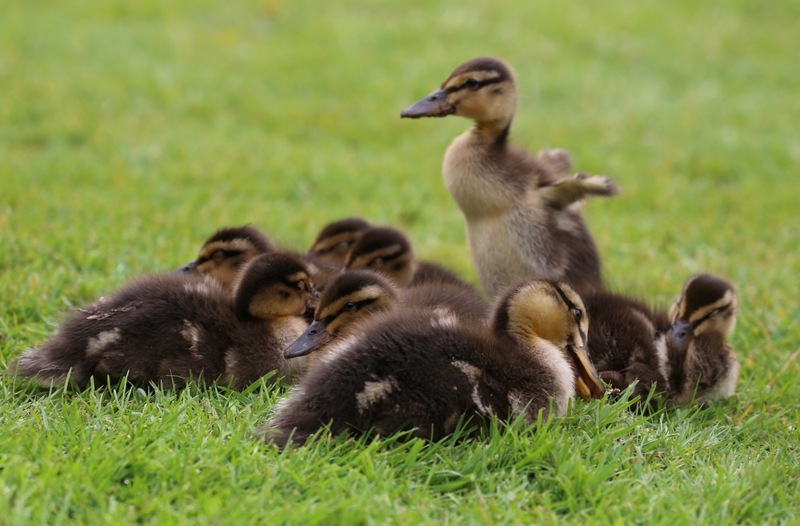 A few days later, my neighbours with a large pond told me the duck had laid eggs in their garden, under an elderly Sage bush, I have been given visitation rights but felt a little disappointed as I had wanted the chicks to be born here. The pair continued to visit and the Drake still did not eat, he cannot feed her in the way other male and female birds do, but he can lead her to a source of food. She lays more than half her body weight in eggs, so needs plenty of rest and nutrition. 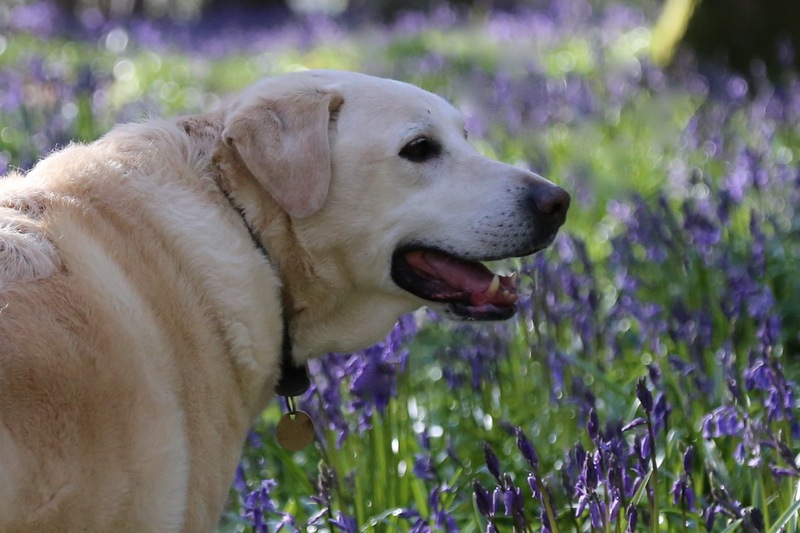 This last week, he has started to eat too, his job is done for this Spring and will be off, their love was brief, they do not pair for life and then if no replacement clutch is needed he joins other groups of males for the summer moult. There is a short period between siring one clutch and the summer moult when groups of males behave in a foul manner towards females, I hope she is spared. 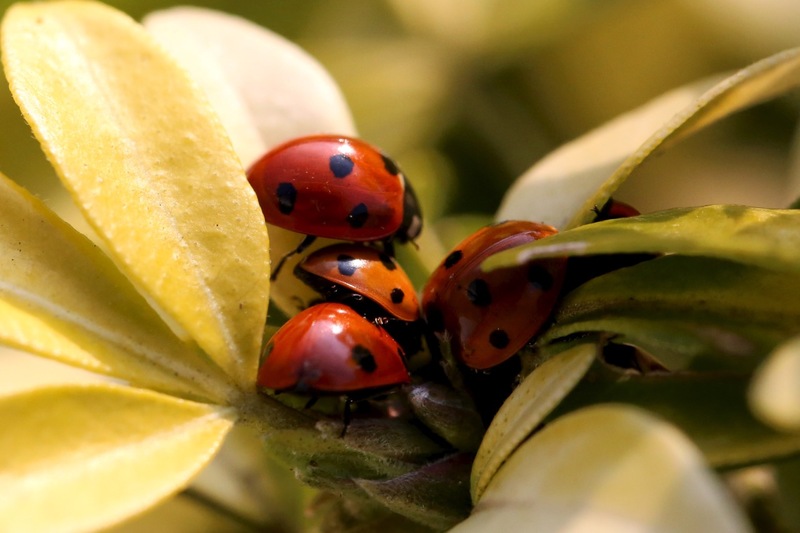 During the late March tidy up I was delighted to see lots of 7 spot native Ladybirds emerging from dormancy and searching for handy mates. 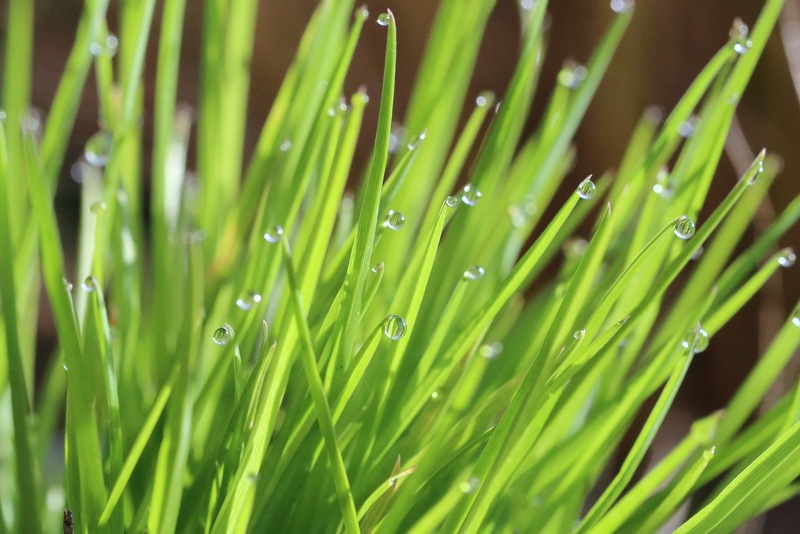 During their year long lives, they can eat 5,000 aphids each, even the larvae eat aphids. The parents die as the new generation emerge and the cycle continues. Elsewhere, the children’s Wildlife Centre has been taken down. They have left home and I wanted to let more light into the potting shed, the centre was a lean-to tacked onto the side, blocking some of the windows. The wood was rotten with only fond memories holding it up and still home to the inspected and usually nocturnal woodlice. 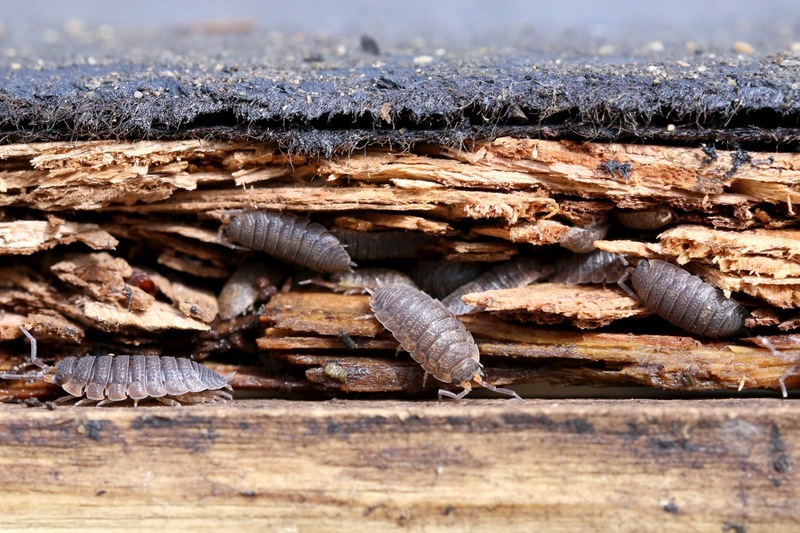 Predated by Toads, woodlice are one of natures recyclers eating rotting vegetation. In its place we now have another small log store with living roof, placed under the shed windows, although we do not need insulation for the wood store, I wanted another growing space for pollinators, hence the living roof. 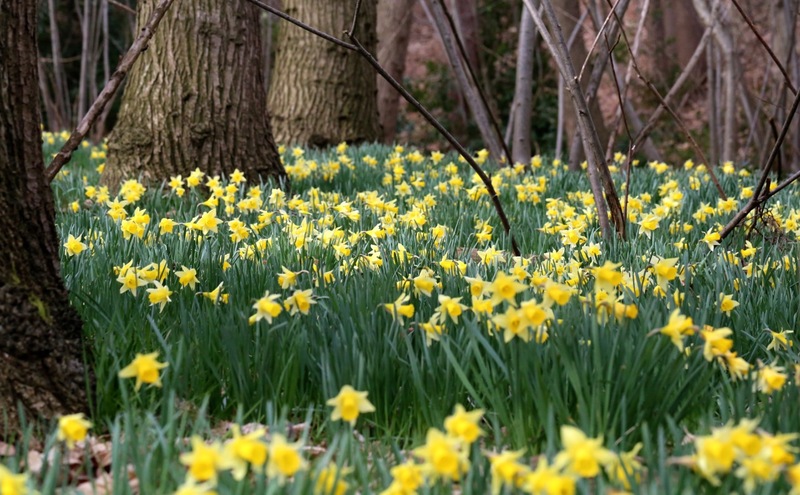 The soil is 3-4″ deep, the spot sunny and sheltered. 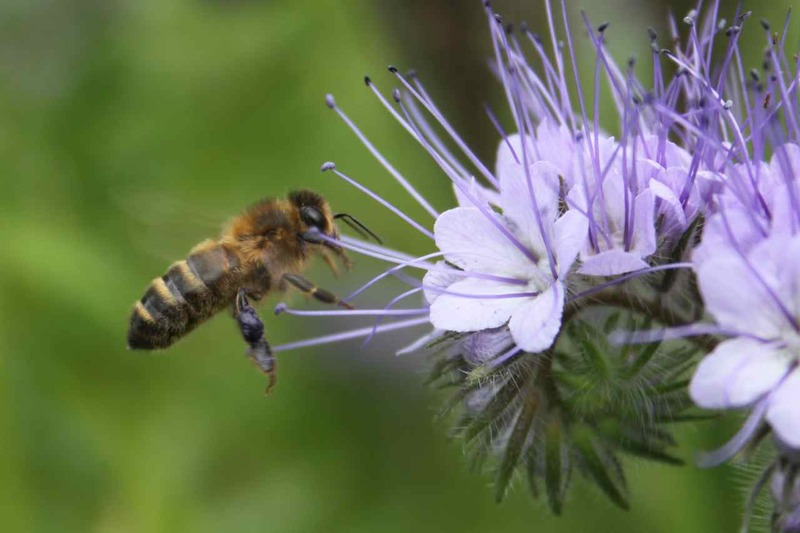 I’m still dithering over plant choices but to start will experiment with some shallow rooted Phacelia tanacetifolia. 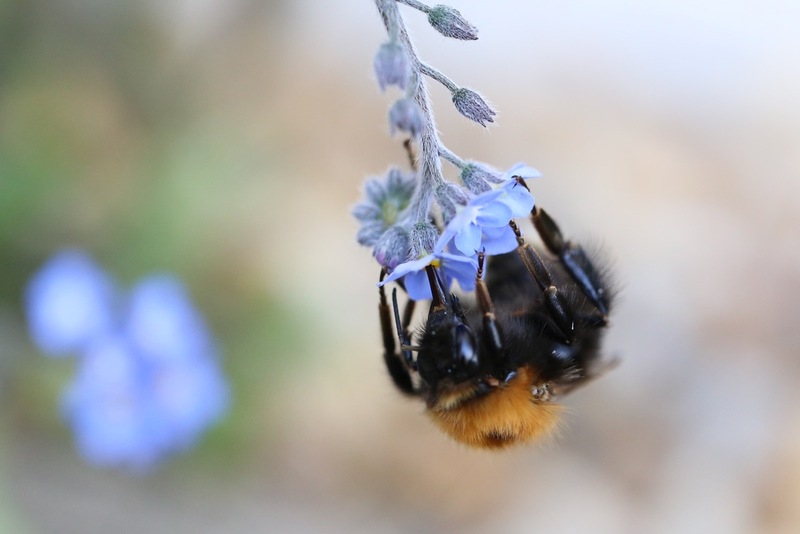 Bees have been foraging too, climate change has enabled the European Tree Bumblebee to make its home in the UK and this worker feeding on self seeded Forget-me-nots had mites and was trying to clean them off by combing its legs over the body, I’ve read on the Bumblebee Conservation Trust website that some mites are not harmful, but if a heavy infestation, when the weight of the mites would inhibit flight a small childs paintbrush can be used to gently brush them off. 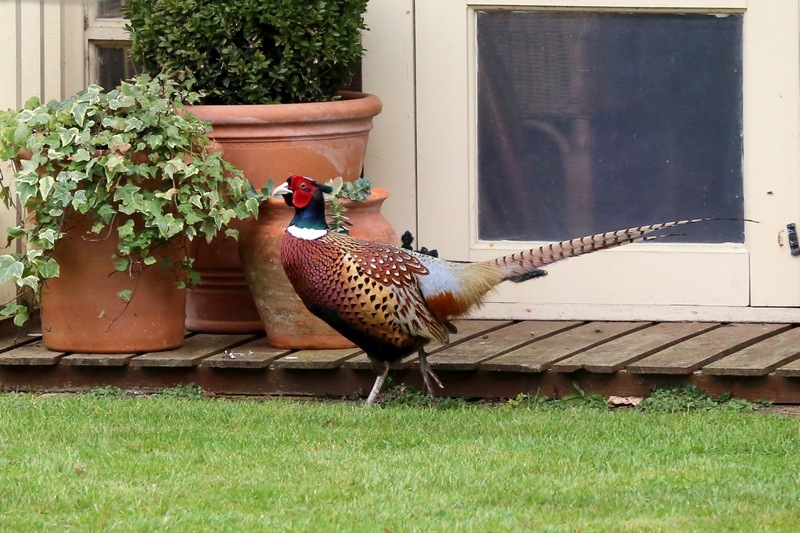 Amongst the usual bird visitors, a male Pheasant has appeared on a daily basis, they were introduced into the UK for gun sport. Its estimated 40 million Pheasants and 10 million Partridges are raised in battery cages for release during the “season”. Animal Aid’s report on the welfare of these birds make gruelling reading. Animal aid are campaigning for a ban on the use of these cages. 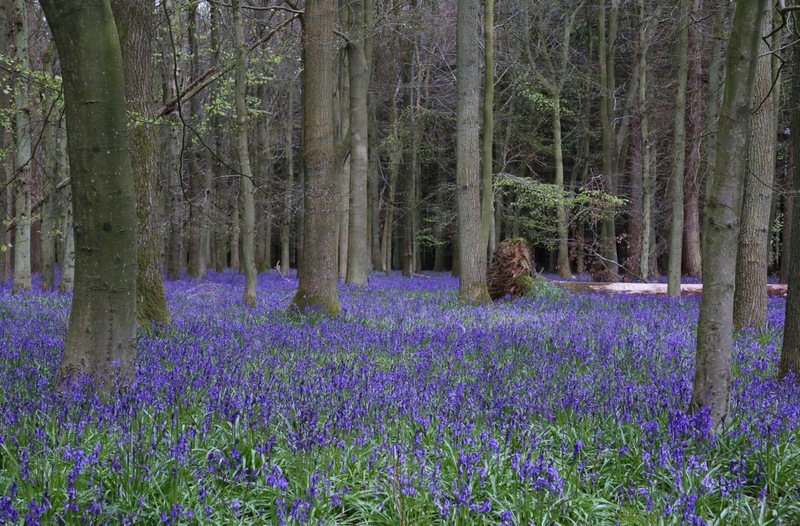 Its quite staggering that the shooting lobby claim these shoots are good for our countryside. In more uplifting news, our Robins have nested and begun to lay eggs but alongside my potting tray behind several stacks of waiting pots, I cannot risk upsetting her, incase she abandons her eggs, I have read she will lay one egg a day usually early morning and a normal clutch is 4-6. They are used to me in and out of the shed but think it will be a step too far to prick out seedlings so close to her. It will be 13 days for her to incubate the eggs, 14 days further for the chicks to fledge and then both adults continue to feed them for a further 3 weeks. So all in all I will be potting on seedlings in the summerhouse this year and hoping to see the chicks in a few weeks time. 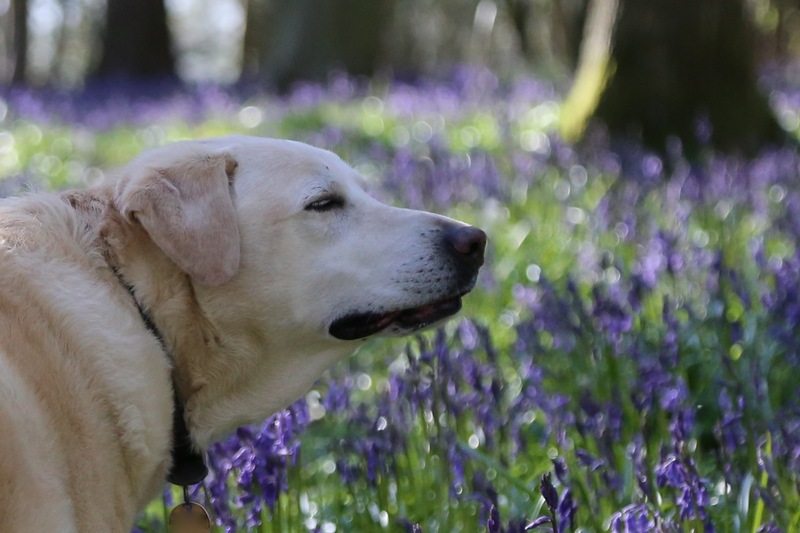 My grateful thanks to the lovely Tina for hosting the Wildlife Wednesday meme, please take a look at other wonderful wildlife across the globe. No pollinators = No Sloes for Sloe Gin. 109 species of insect are associated with Blackthorn , including the rare Black Hair Streak Butterfly. 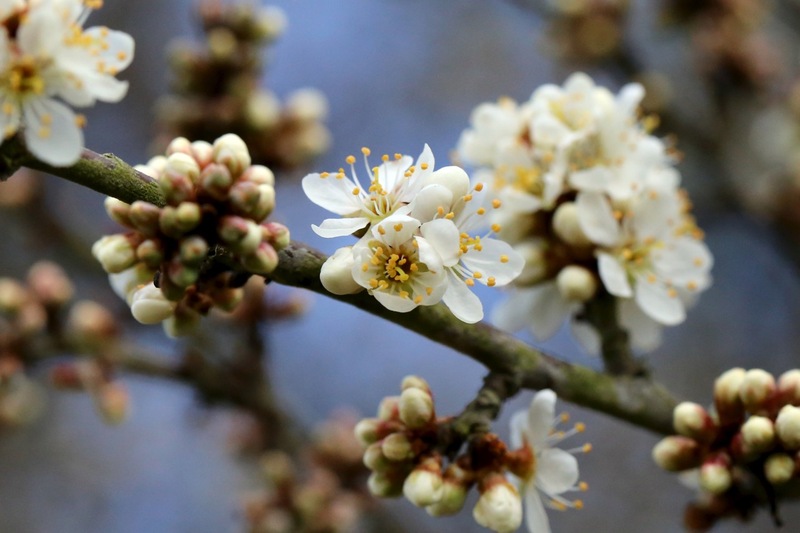 As an early native flowering hedgerow plant, Blackthorn provides valuable nectar and pollen for bees and other pollinators. The foliage which appears after the flowers is food for many moth caterpillars. Birds, including Nightingales and Blackbirds nest within the thorny dense thickets and as part of the food web, eat the caterpillars and other insects on the leaves. Birds also feast on the sloe berries in the Autumn.